It only took a few minutes on the phone with Will Scott to realize what an extraordinary farmer we were speaking too. From his roots as a sharecropper’s son, to his military service in Vietnam, to three decades of service as an engineer, and now two decades of selling the food he grows at farmer’s markets, he knows about commitment and dedication. Scott not only farms, he mentors. 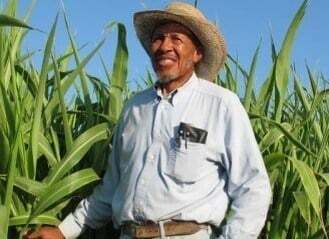 As founder of African-American Farmers of California, he offers help to new and existing farmers in the form of training, learning opportunities, and leasable farm land. CA Grown: What crops do you grow? Will: We grow seasonal crops, black eye peas, okra, turnips, and tomatoes. Right now, we are into our cold winter crops which are mustard greens, turnip greens, collards, spinach, broccoli and carrots. We sell our produce at Freedom Farmers Markets in Oakland on Telegraph Ave. every Saturday from 10-3PM. Will: I planted mustard seeds this morning. Then I came home and shelled black eye peas to sell on Saturday at the farmers’ market. Will: I enjoy it because it puts me close to nature. Planting seeds and watching them grow and become a part of life has always been fascinating for me. Will: I am the current president of the African American Farmers of California. We work with churches, USDA, Fresno State, and UC Extensions. We are very active in the community sharing information about farming and offering food distribution assistance wherever it is needed. I also work with the with the Boys Club and West Fresno development center. Will: I was born on a farm. My father and grandfather were sharecroppers. I was taught the importance of education and working hard to take care of the family. We each have a purpose in life and sometimes it takes a while to find your purpose. When I retired from my first career and realized there was a need for quality vegetables, I figured that farming was in my DNA so I started out small with five acres. I did not feel like the produce you could buy at stores was very good quality. I felt there was a need for good quality produce and felt like I could provide it through farming. Like other farms, I went through disasters with drought and a couple of crop failures. Now I’m ready to increase my production so more people can have access to quality food. Currently I have forty acres but with limited water, I only farm on about 15 acres. I have two brothers that help me on the farm. I will bring contractors in when help is needed to harvest or weed control. Will: I like to fish and I think I’m one of the better fishermen in Fresno. When I was younger I played tennis, and I’ve started doing some writing to see if I can get published. I’m also active in the church as a Sunday school teacher. Will: A great way to start is to contact a farmer and ask them to mentor you. Our organization (African American Farmers) brings in people who want to learn about farming. We have a 16 acre demonstration farm and we offer classes that can help people who are interested in learning about farming. We need to get back to the times when everyone had a garden in their own backyard.